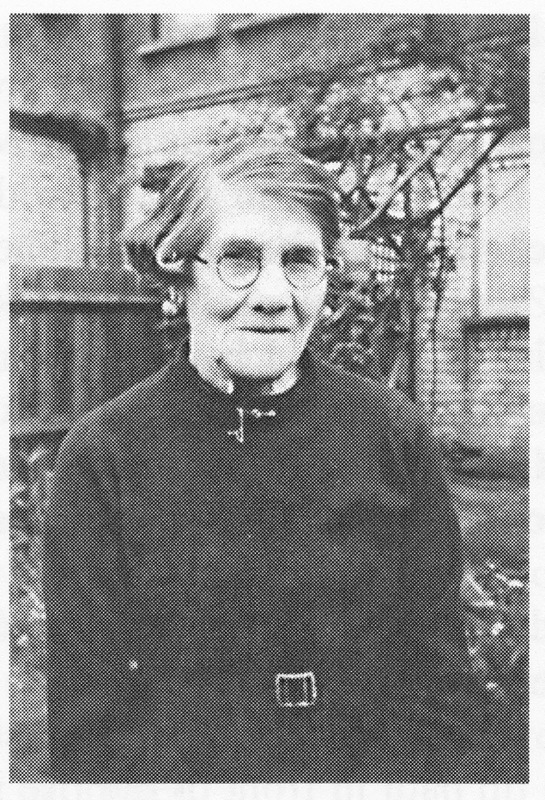 Clara Cockram, perhaps in the 1930s or 40s. Looking at George's siblings, and hunting for their living descendants, I realized that of the twelve children born to William and Prudence Cockram (George's parents), all of whom lived to at least early adulthood, only six of them had children of their own. I find that rather remarkable, considering the times they lived in - their childbearing years roughly spanned 1860-1915. Nevertheless, the six who did reproduce managed to have at least 37 children altogether, so there's no shortage of Cockram descendants. And recently, I found four more of them - my 3rd cousins Helen, Lizzie, Karen and Simon. Their great-grandmother was Clara Cockram, George's youngest sister. I have a particular interest in Clara, as I have a feeling George was rather fond of her, and I had hopes that he corresponded with her from Canada, and told her why he changed his name. Helen has found several interesting documents among the family papers, but sadly, there are no letters from George among them. But that doesn't curb my interest in Clara. I've been lucky enough to find pictures of most of the houses she lived in, as well as a few other significant places in her life, so I thought I'd make a map of them, just to see if Google's 'My Maps' application is really as easy to use as they say it is. UPDATE: Two days after spending a ridiculous amount of time going through the tedious process of adding pictures to the map, I've discovered that almost all of them are now refusing to show up. So I've added some of them to this post instead. The most you can hope for from the map is that it will show you the locations of these places - don't count on anything else. Cross your fingers and click on the map for a larger, zoomable version, and if by some miracle you can see the photos, please let me know. And take my advice - don't ever bother trying to make a customised map with Google. Life's too short. for the minor canons of St Pauls. Clara was born in Bickington, Devon in 1864 and the family moved to nearby Fremington when she was still a girl. As a young woman, Clara left Devon and went to live and work in London, no doubt making the 200 mile journey by train. Her older brother Thomas lived in London at that time, and she probably relied on him until she found herself a job. 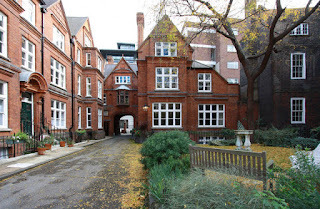 By 1891 she had done so - the census for that year shows her at the age of 27 as a live-in housemaid for an Anglican clergyman at 7 Amen Court, near St Paul's Cathedral. I don't know when or where Clara met her future husband, Henry Moran - he was her first cousin, so they may have known each other since childhood - but Henry grew up in London, so that's not altogether likely. 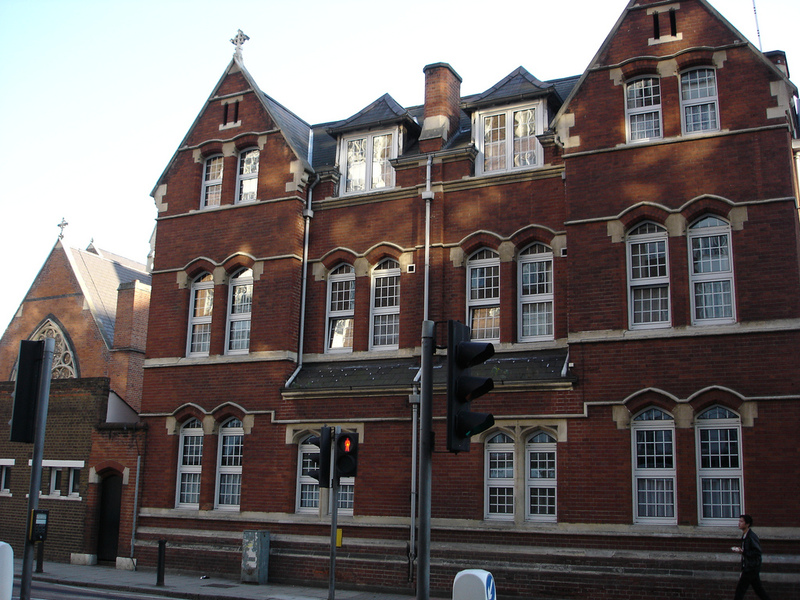 In 1891, at the age of 22, he was living at 80 Corporation Buildings in Clerkenwell, London, with his younger brother and sister. 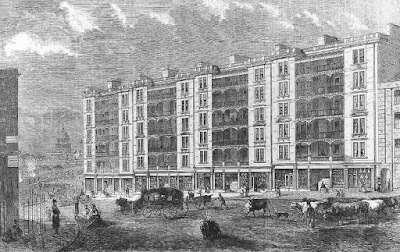 These were large apartment buildings built in 1865, intended for the poor, but they were quite well appointed for their time, complete with balconies and indoor toilets, and were inhabited by many working and middle class tenants. 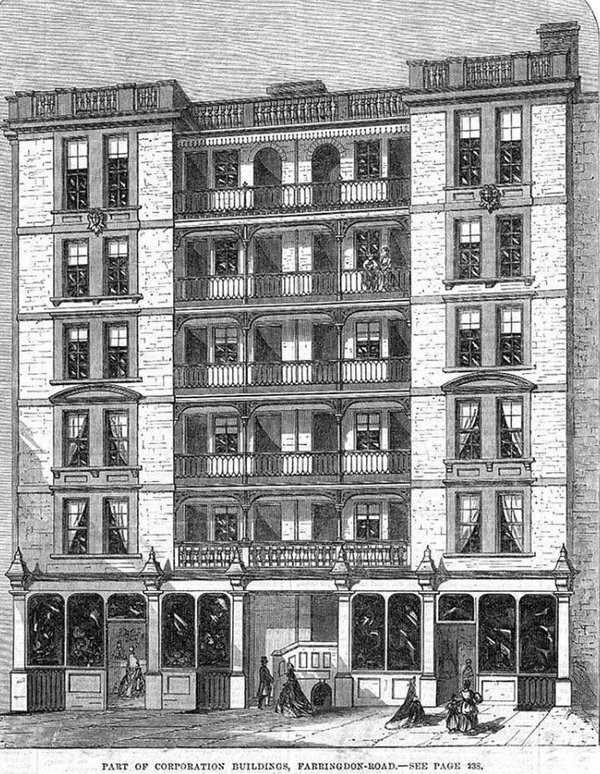 In 1894, Clara was living at the same address. Perhaps she had moved in as a flatmate with her three cousins, and a relationship with Henry grew from there. 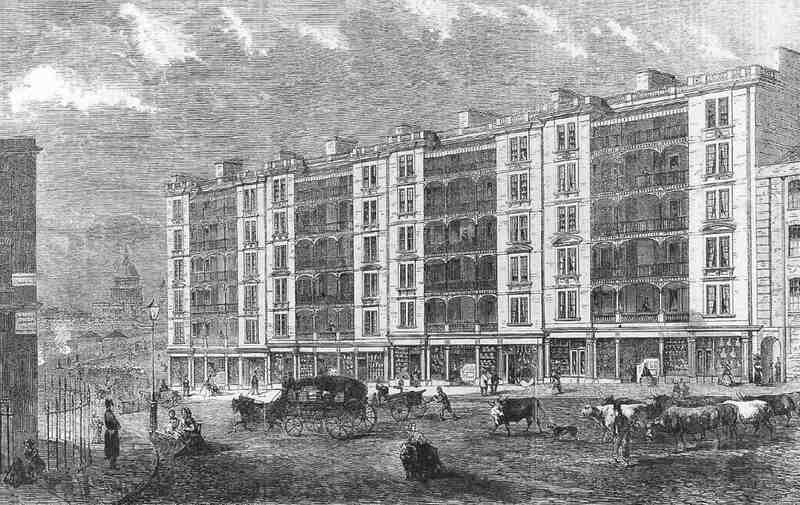 Part of the Corporation Buildings, in 1865.
and two without. Other apartments had two bedrooms. 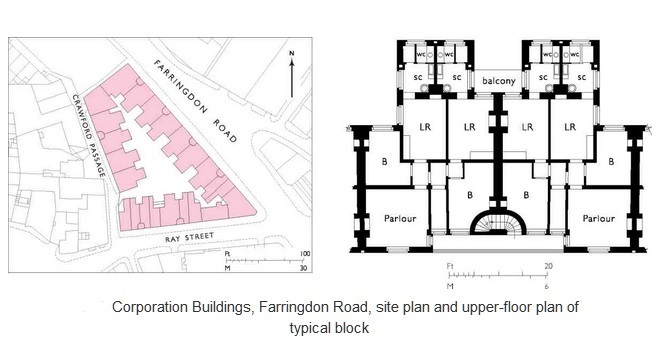 All apartments were accessed via spiral staircases leading to balconies on each floor. 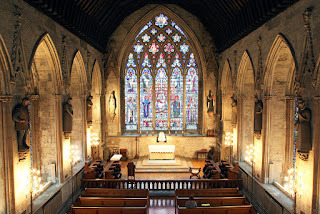 Henry was Catholic; Clara was Church of England - but in 1894, when he was 25 and she was 30, they were married at St Etheldreda's church, the oldest Catholic church in England, built around 1250. Clara may have converted to Catholicism, but not necessarily. 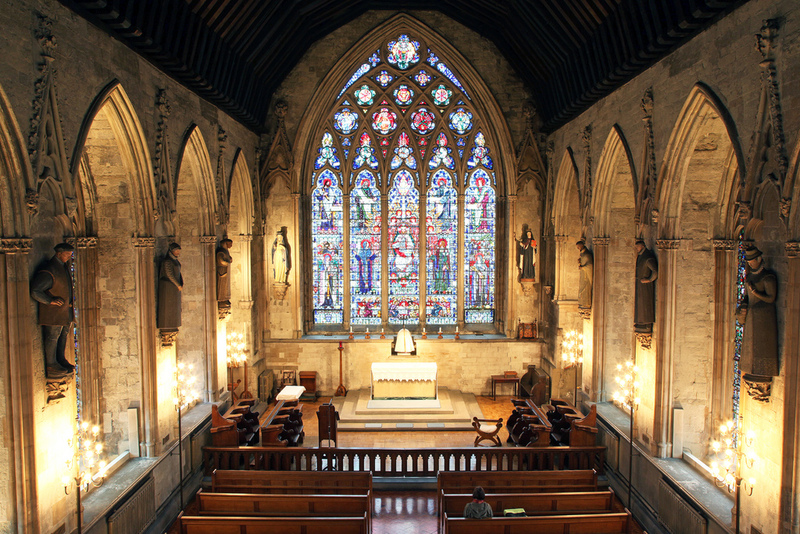 A non-Catholic could marry in a Catholic church if she'd had a Christian baptism, learned the ways of the Catholic church and agreed to raise her children as Catholics. The potentially bigger barrier to the marriage was the fact that they were first cousins. Until fairly recently, the Catholic church didn't like second cousins marrying, never mind first cousins. So they would have had to get a special dispensation from the local bishop before the marriage could go ahead. 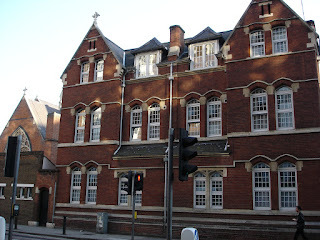 By 1901 they were living in Islington, London, and Henry was a scientific instrument maker. I haven't found anything more specific about his work, except that in 1919 he applied for a patent for an 'Improved knife and fork for use together in one hand'. Whatever he did, he apparently made a reasonable amount of money. 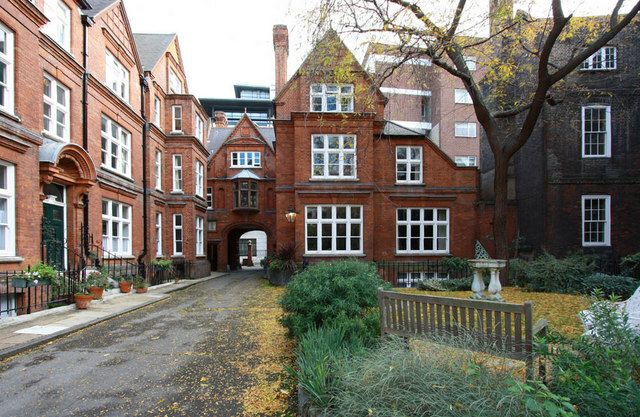 He bought a large house in Hartham Road, Islington, and this is where they stayed. On the 1911 census, Henry described the house as having nine rooms - but someone crossed that out and changed it to six. 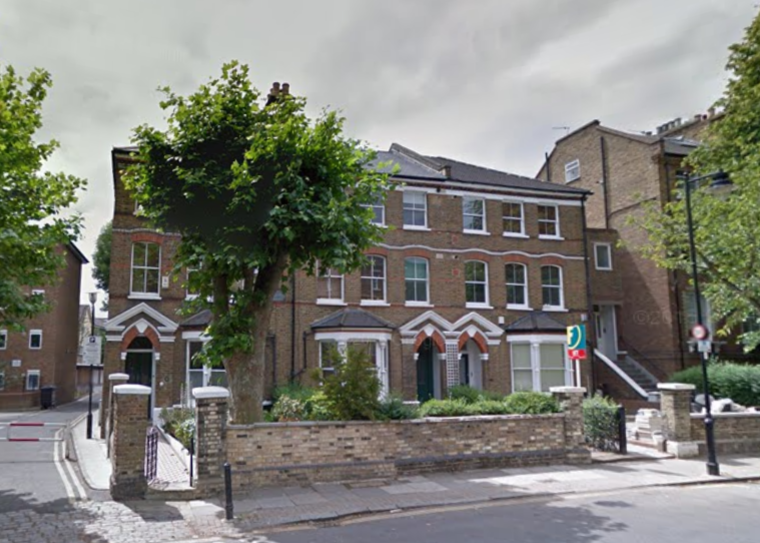 I suspect that George stayed with Clara and Henry at this house for a time, when he visited London in 1911 - but that story is for another time. They had four children - Etheldreda (at last I know where that name came from! ), Evelyn, Francis and Stella. Henry died in 1927, and Clara stayed at the Hartham Road house, often sharing it with other people, including her daughter Evelyn, her widowed sister Lucy, and other people who I assume were lodgers. Etheldreda and her family lived a couple of bus rides away in North Finchley, and Clara had a close relationship with them. Francis and his family were nearby too. Stella had Down Syndrome and lived with her mother until about 1939 - from then on, she lived at Nazareth House, a care home not far away. When World War Two broke out, Clara was 75 years old. The 1939 Register, taken in September that year, shows her in Swanage, on the coast of Dorset. Many people left London around that time, because there was a general fear of London being bombed, and this may be why Clara left. On the other hand, her daughter Etheldreda's family had planned a holiday in Swanage in August 1939, which they cancelled, because Etheldreda's husband Henry Golton, a senior civil servant, had his leave cancelled due to preparations for war. Perhaps Clara had intended to join them on that holiday, and in the end, she went alone. or Clara might have been staying with friends. Below is the view from in front of the house, which is near the top of a steep hill. In any case, she was soon back home in London. Later on when London came under attack, a couple of houses in Hartham Road were destroyed, and Clara's house was damaged, but not so badly that she had to leave - in fact she was determined to stay put. Clara saw the war out and carried on until 1950, when at the age of 86 she died of bronchopneumonia, at the French Hospital in Shaftesbury Avenue, London. She left her money, around £1200, to Evelyn and Francis, and I presume she left the house to Evelyn, who was still living there in 1953. 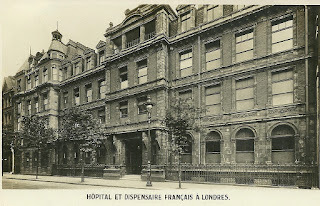 The French Hospital, Shaftesbury Ave, London. 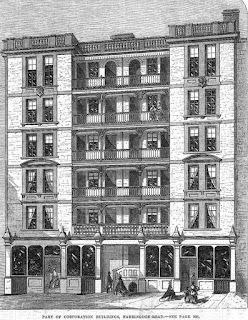 This building is now a hotel.